This is a Windows program that turns programs written in a simple scripting language into assembly language. There are editors for sprites, blocks, screen layouts, there is even a script generator allowing the user to get started with some common templates. The language is considerably more powerful than the Spectrum and CPC versions with WHILE loops, collectable blocks, READ, DATA and much more. AGD will produce games for the Spectrum, Amstrad CPC, Acorn Atom and Timex Sinclair/Next with more machines in the pipeline. Fancy importing an old game written with AGD 4 and converting it to use Timex graphics on the Next, or perhaps doing an Amstrad conversion? It's easy with this tool! Now with Dragon, Acorn Electron and Enterprise included, compilers and engines pending. The latest update will generate the code for pushable block sprites or orbiting satellite sprites at the click of a mouse. Now updated with nine games for the ZX Vega, keymap files are included. Unzip this file and copy the directory onto your Vega SD card to play. The games featured are Egghead 6 - Egghead Goes to Town, Jubbles, Rallybug, Lunaris, Gamex 2 - Playing Dividends, Encyclopaedia Galactica, Amusement Park, Area 51 and Retro Racer. 128K/+2 only. Create your own arcade games - platformers, shooters, arcade adventures or whatever. Games are fast, smooth and work on any Spectrum except the 16K. A special customised version of AGD for the SPECTRA interface which has been designed to take advantage of the extra colours. Functionality is as AGD 2.7 with a few of the improvements which were added to later versions. Travel around the galaxy, visiting dozens of planets and researching new lifeforms for the great tome. Visit long-dead alien civilisations, loot tombs, explore vast oceans and much much more. Simple overhead view racer written in 4 evenings for Speccy Jam #2. Fast and frantic action set in the kitchens at Byte Back. Graphics courtesy of Craig Stevenson, music by Yerzmyey. A game where you compete against yourself. Force your clones to collide with each other to become the last man standing. Music by Yerzmyey. 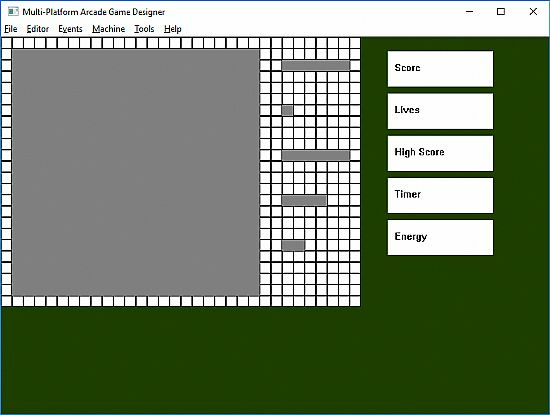 This is the latest version of my guide which explains how to write Spectrum games although it does assume the reader has some knowledge of assembly basics beforehand. Step-by-step, it shows you how to put things on the screen, move them around, read the keyboard, play sounds etc. It even covers BASIC loaders. Everything you need to start writing your own ZX Spectrum games in 97 pages.